I knew from the title that this was going to be a post I would have to save until I felt emotionally ready to read. Although, I don’t believe anything can prepare us for the horrors they must have suffered, it is imperative that we remember the atrocities and learn from our past. When I was in Japan, I visited the Peace Memorial in Hiroshima. The bushes to the entrance were shaped like they were melting…that I could handle. The first floor had maps of the city and the history of the atomic bomb…that I could handle. However, when I got to the second floor and saw the displays of burned and twisted bicycles and lunch boxes the children carried to school that fateful morning…I broke out in sobs. A Japanese woman came over to console me, and without words, we stood in the middle of the room and hugged each other and cried. That, I will never forget. The same thing happened at the Holocaust Museum in Washington D.C., the piles of shoes brought forth the tears. 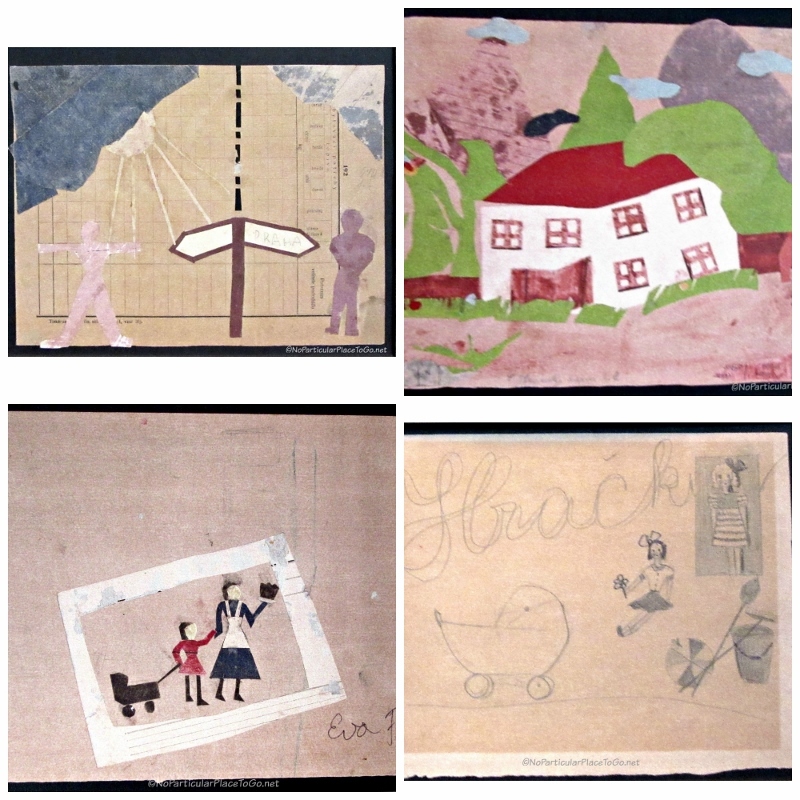 The personal remnants of their lives, like these paintings, fill me with an unbearable sadness. When will we ever learn the lessons that are right before our eyes? Wow…what a post. It reminded me of our visit to Punchbowl Cemetery on Oahu. Very depressing what man does to each other. This is a very thoughtful and timely post. It is so important to be aware of past atrocities, but also to see the effect of similar atrocities on our world today. Peta & Ben from Green Global Trek put is so well. Yes – there is no limit to ‘man’s inhumanity to man’, but it’s important to note man’s resistance to it and ability to rise above it. We have to believe it’s possible to be better. So, visit places like Terezin – but be aware of the history being made, here and now, and do what you can to make the world better. Well said, Yasha. We read stories every day about the impact that one person can make and we’ve seen many examples of what can be accomplished when people work together. By learning about the past, we can prepare for the future and hopefully, carry the message of respect and tolerance for our fellow neighbors with us in our day-to-day actions. Gilda, thank you for your lovely comment. Our visit was extremely moving and we’re so glad that you were touched by the story of Terezin too. We agree that it’s important for people to visit sites like Terezin and keep educating themselves and others about what can and will happen when we let hate and intolerance flourish. That might be the best way to honor those who perished. It’s not easy to visit places like Terezin, and we have to do what we can to make sure such things never happen again. But there is a trace of hope in those children’s pictures – even in the most appalling circumstances people will do what they can to keep their spirits alive. There were several accounts that we read of Terezin that commented on how the people formed a close knit community and tried to shield the children from the worst of the horrors. And your observation that people will make great efforts to keep their spirits intact was certainly true here. We were really amazed (and humbled) to find out that, even with the very lack of basic necessities and the day-to-day fight to survive, there were still those who sketched and painted, created music or wrote poetry. I can add little more to the above thoughtful comments, save to repeat: Yes, (as I too deliberately did at Dachau on my brief stop in Germany last fall), it is the very least we can do to take the time to pay our respects and remember the lives of so many men, women and children so deliberately and cruelly exterminated. We remembered seeing school groups of older children at the Holocaust Memorial Museum in DC and have to agree with you that visits to sites such as Terezin or other camps would teach a lot about what intolerance and hatred can lead to. All one needs is to see the photos of individual people, hear a family’s story or see a child’s drawing to realize that the victims of Terezin and the millions exterminated in the Holocaust were people just like you or me. It seems that a lesson like that would definitely go a long way to quashing much of the racism, religious intolerance, hate speech and hate crimes happening today. I completely agree with you in that as difficult as it is to visit such sites as Terezin and Dachau it is important to bear witness. It pays respect to those you suffered so much. We visited Dachau in 2015. We were fortunate in that we found a small tour group, just 4 of us with a guide, so we were able to ask questions and our guide was a wealth of knowledge. It was a powerful experience, to visit Dachau, and it took me a few days before I could tell the story, as I’m sure it took you as well. I wanted to do it justice, just as you’ve done. Amazing story that the artist had the foresight to work with the children and to hide the paintings. We did not make it to Terezin when we were in the Czech Republic, but if we make it back we’ll visit Terezin. Like you, Patti, it took several days for us to absorb the impact of our visit to Terezin and even longer to decide how to tell a part of the story. If we get a chance to visit another camp, I’d like to follow your lead and hire a personal guide who can lend more insight into what we’re seeing as well as answer our questions. 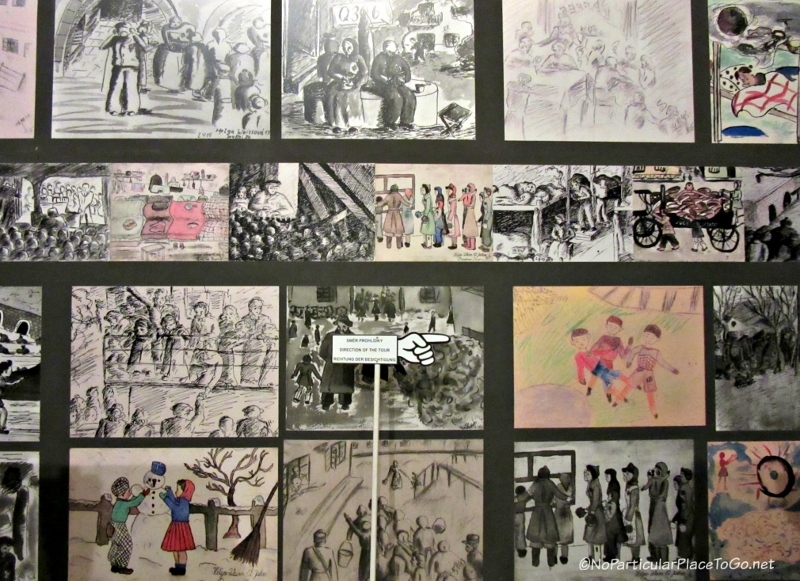 What struck us as a interesting coincidence was finding out that we’d seen some of the children’s drawings years before at the Holocaust Memorial Museum in DC and then finding out that the deportation of the Danish Jews (who we wrote about last year) to Terezin had triggered the Red Cross inquiry into the camp conditions. Interweaving some of what we’ve learned elsewhere makes stories like these even more meaningful for us. Sad that atrocities like this were happening right before I was born. I pray that they, or shades of them, never happen again. I hope to visit one of these memorials. You’d definitely find a visit well worth your time, Carol. It’s not fun nor easy but we think that learning about the camps and remembering the victims helps raise awareness about intolerance and hatred of all kinds. Traveling has given us a broader understanding of history but it’s disheartening to see how humans seem never to learn the lessons taught about hatred, conquest and greed. Excellent post, but really depressing. The whole story about the Red Cross visit is almost unbelievable but I guess you look at stuff going on currently it’s not so hard to imagine people having the wool pulled over their eyes. Especially when nobody really wants to know the truth. It’s horribly depressing Frank and it’s sadly true that people believe what they want to believe. How else to explain the conspiracy theorists, the Holocaust deniers and the Fake News aficionados? In many of the towns that were next to the death camps, the citizens closed their eyes (and held their noses) to what was going on and flat up and down refused to believe that their silence made them a part of the atrocities even when ashes from the crematoriums drifted down. I remember thinking when I first learned of the Holocaust that something like that could never happen again but we’ve seen that genocides are an ongoing occurrence around the world. And, what still has us reeling with the current administration in the US, is the rapid rise of hate crimes, police shootings of blacks and other minorities and our elected leaders condoning hate speech by various groups. Absolutely unforgivable. 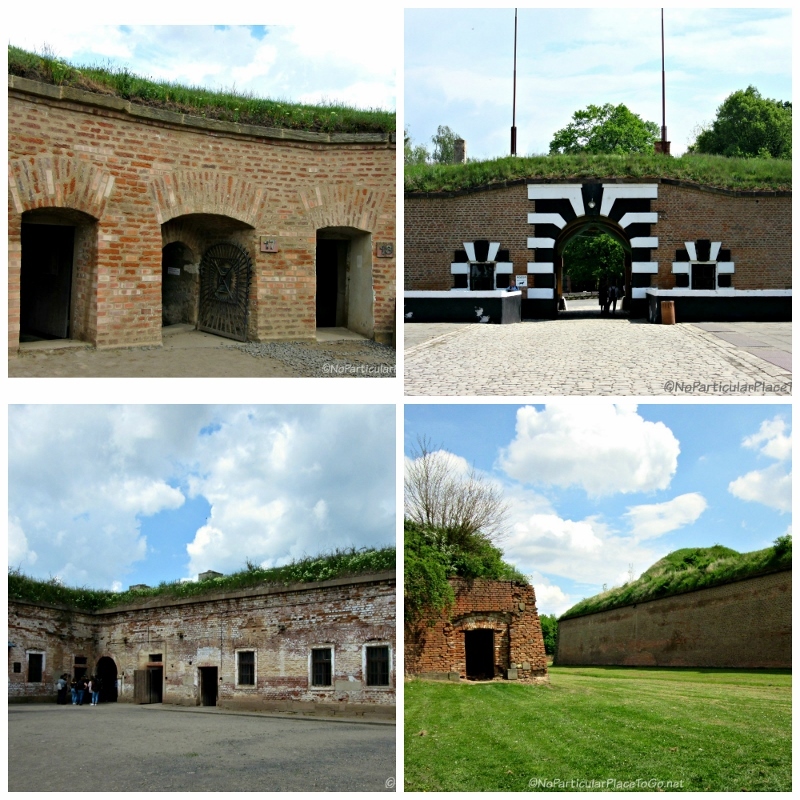 Thanks for this post about Terezin, Anita. It is not a place I would visit, but I truly appreciate the message of your post. Thanks Doreen. 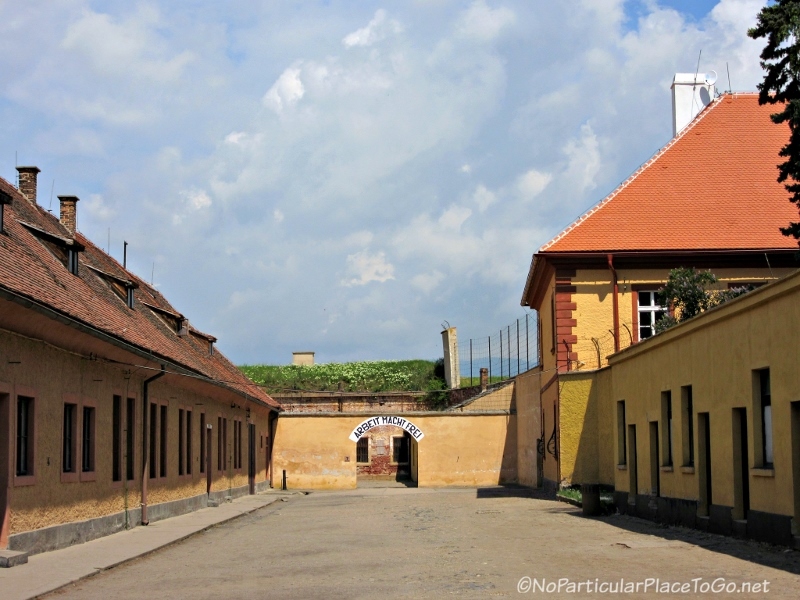 Terezin is a difficult place to visit and I can certainly see why many can’t. However, learning about the camps and the victims is also a good way to honor the memory of the thousands of people who passed through. We can’t change the past but we can remember those who perished. Anita and Richard, as Jews whose family members have directly been impacted by the Nazi attempt at extermination of our people, it is particularly interesting to read this blog post. 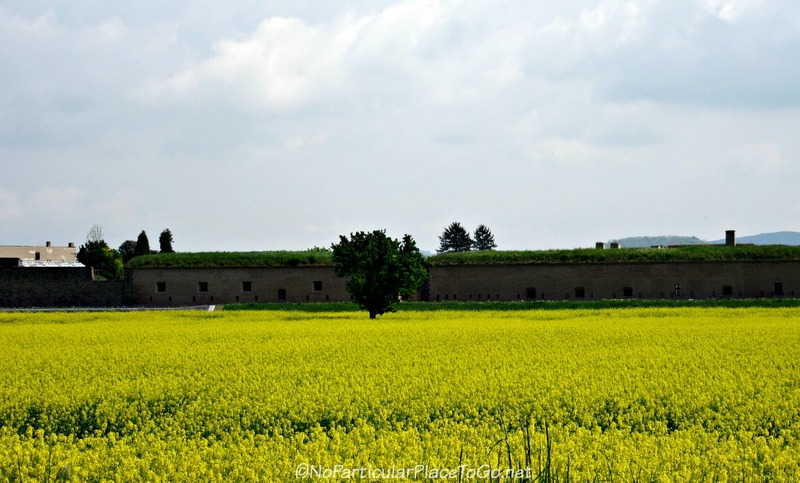 You have done a wonderful job at distinguishing the long history of the castle, which then become the Terezin concentration camp, so that its fuller history not be entirely marred by the later use of the grounds by the nazis. One has to wonder what art and culture thrives in todays vast holding camps in Syria or a myriad other geographies where people are held against their will in abject conditions. Is the West not passively complicit again and again in the face of organized brutality? To the comments of “we must not let it happen again”… tragically, it IS happening again and again and again. We take solace behind the easy cliche of never again, but reality alas is much crueler. The West stands by as different populations are mistreated by evil forces and we elect national leaders who refuse to come to the assistance of large waves of refugees. Thank you for a very thoughtful and richly substantiated post. Oh Peta and Ben, thank you for this wonderfully thoughtful comment. We, too were fascinated by the ghetto culture that arose and thrived amidst the day-to-day deprivations and misery of Teresin. The fact that these persecuted and tortured people were able to develop a close-knit community of support and celebrate life in teaching others, creating art and music is really astonishing. And we echo your thoughts in wondering what art, music and other cultural pursuits might exist now in war-torn countries and refugee camps that speaks to the longing to create, celebrate life’s beauty or stark truths and leave behind a legacy even when one’s very survival is threatened. Like you, we cannot help but draw parallels between the Nazi’s attempts to exterminate the Jews and other vulnerable groups during WWII to Stalin’s ruthless purges of 36 million of his own countrymen, the massacres in Bosnia-Hersegovina, etc. right down to Bashar al-Assad’s horrific war with his own people in what’s left of Syria. This was a very interesting post post and so sad about this particular atrocity during WW2. 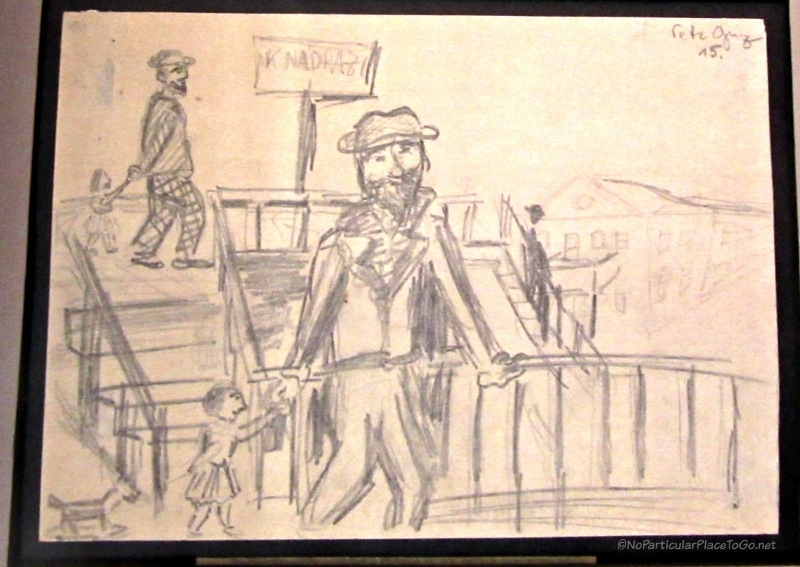 I was so moved that Freidl Dicker-Brandeis would fill her suitcase with art supplies and help all those children. So glad the suitcases filled with their drawings was hidden. Thank you for sharing the story that should never be forgotten. It’s so important to remember the Holocaust and I applaud you for writing about such less-than-cheerful subjects. It’s so easy to be a travel blogger and just write the good stuff “10 Great Places to Eat in XYZ.” Especially for readers who don’t travel much, we need to write about places like Terezin / Theresienstadt so that they will understand that the Holocaust was real, not “fake news” as many would like to believe. Those children’s drawings are truly heartbreaking. I saw some on display at the synagogue in Prague: so moving. Over the years our travel has evolved to include places where we can learn more about the past and how it shapes our present world which we both find fascinating. There are so many back stories in each city we visit in Europe that, while it’s fun to talk about good food and fun places, the history is what keeps holding our attention and the stories are what we find ourselves drawn to write about. We cannot understand the sheer ignorance of those who deny that the Holocaust occurred (a blatant form of anti-semitism in itself) when so many places exist that attest otherwise. We’re so glad you liked this post. Rachel and thank you for your lovely comment. So sad what we humans are capable of. So heartbreaking. And yet I’m always heartened by the stories of resilience, and the ongoing spark of life as seen by the musicians and the art classes for the children. What a sobering place it must have been to visit. Allison, it is so disheartening to see what people do to each other for reasons that we just can’t understand. But, like you say, it’s amazing to learn about and see the will to survive in these circumstances and even create, in some of mankind’s darkest times. There were several stories of the people in Terezin helping each other in small ways, supporting each other and forming a community that were truly inspiring. I haven’t visited Terezin or any place like it. I imagine it would be sobering and disturbing in a way which would haunt. I’m torn about visiting these places, but I recognize the importance of remembering.The children’s drawings are so beautiful and heartbreaking. You’re so right that visiting a place like Terezin is very disturbing, Donna and we still carry that feeling with us. And it’s heartbreaking to see the children’s pictures and realize that the majority of them had their lives stolen from them for reasons that are incomprehensible. However, we feel when we visit a place like Terezin, that we honor the victims in a small way by learning about the Holocaust and recognizing what racism, religious intolerance, etc. can lead to. There’s always the hope that enough people will say, “Never forget” and never again. Thanks for posting this! 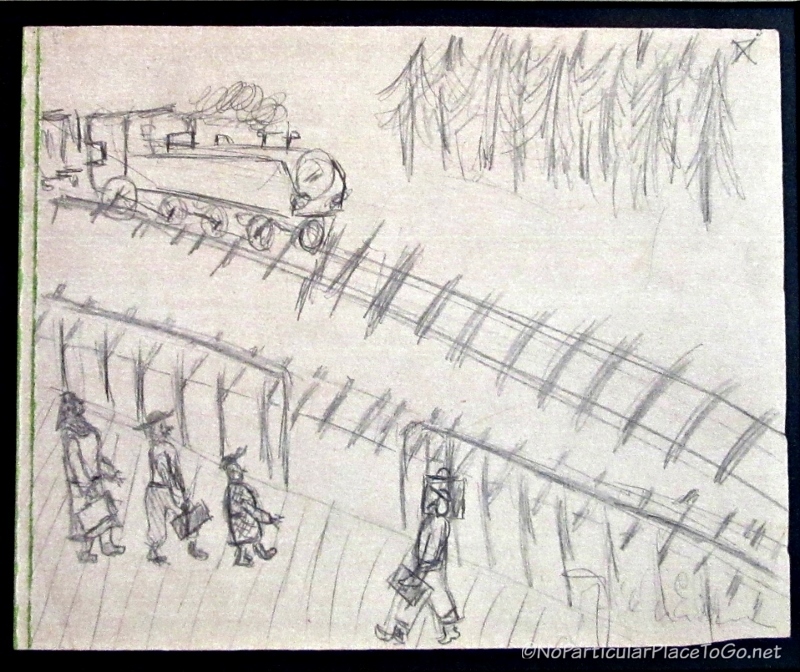 When I visited Terezin in about 2004, it was also the children’s pictures that were most moving and saddening for me to witness, although everything about it, from the Arbeit Macht Frei slogan over the gate to the “showers”, was absolutely chilling, knowing what transpired there. A few days later I visited the Jewish memorial and cemetary in Prague, and again was moved to tears by the names of all Czech Jews who were killed in Terezin or later other concentration camps, and by the pictures drawn by the children. 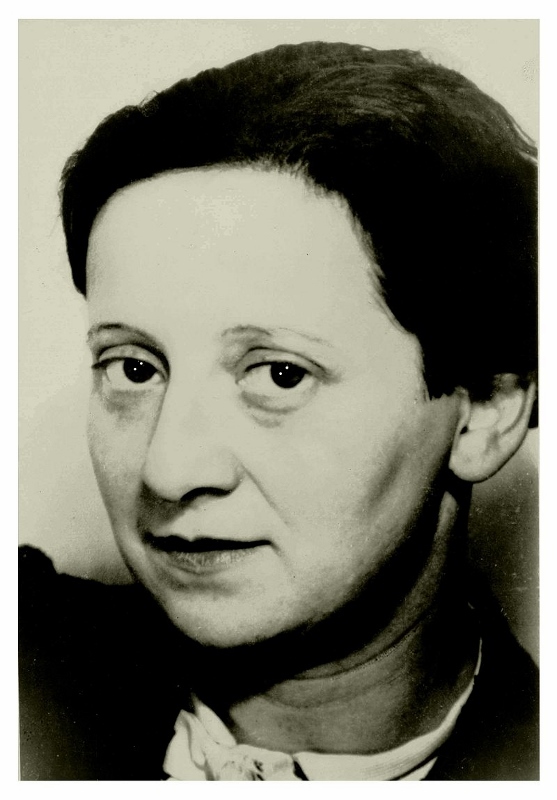 We all owe a debt of gratitude for Freidl Dicker-Brandeis for her foresight in providing the art lessons for the children and for preserving them for posterity. You are so right, we must all pay attention to the rise of racism, anti-religious bigotry, homophobia and all others forms of systemic, culturally supported prejudice and discrimination in our own countries and around the world, and do our best to counter it , through peaceful means, thoughtful discourse, and outreach. The Holocaust Memorial Museum in Washington DC is a good place for US and Canadian residents to begin their own education on this. As always, well done! Thanks Nancy! Your wonderful comment perfectly sums up our thoughts and feelings each time we visit a place that commemorates the victims of the Holocaust. Putting faces to the roll call of names and, in this case, seeing pictures drawn by children who were heartlessly exterminated, makes the horror of this dark period of history more relatable. It also makes us even more sensitive to the increase in hate crimes in the US and the current administration’s outright discrimination of many groups of people. This in NOT what America stands for. Amazing post. I got sadder as l read, but you’re right, these places are important to see and experience. We really can’t afford to forget as it might happen again. I’ve come to believe the Nazis had a blueprint for these camps, right down to the phony Red Cross photos of smiling victims before they are killed. Good must continue to triumph. Since you and Federico just recently visited Auschwitz-Birkenau, you know how heartbreaking it can be to see what people are capable of. And, for those who deny that a Holocaust happened, these memorials to the victims serve as important proof that the atrocities happened as well as urge us to be aware of the the rise in Neo-Naxi movements and other hate groups. The more people who see Terezin and Auschwitz-Birkenau, the less chance that this evil will succeed. What an amazing piece of history you’ve written here. Really makes me take a step back and realize how grateful I should be for the stability of my own life. We too feel grateful, Susan, that we’ve never had to live in a country destroyed by war nor feared for the lives of our families and children. 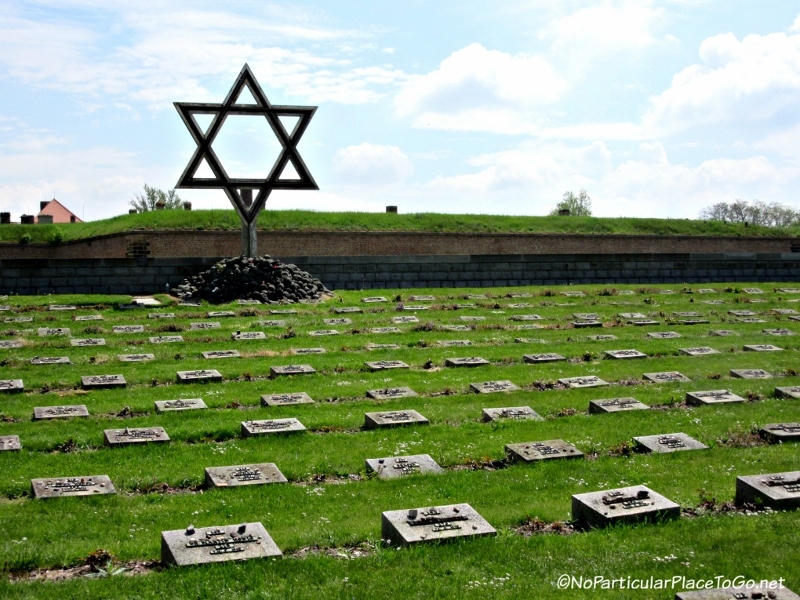 The history of Terezin and the death camps is brutal and appalling and a visit to a place like Terezin left us saddened and slightly sick-to-our stomachs afterwards. All we can do is hope that more people learn about or remember this period of history and stand up to religious intolerance, racism and other acts of hatred. Thanks so very much for your visit. I wish these photos and stories could be in every publication world over. We can never,ever forget. As we travel in Europe, Maida, it’s not hard to see the impact that WWII had throughout the continent and learn about the history of anti-Semitism throughout the centuries.. History becomes more personal to us when we see the places where events occurred, learn some of the stories about the people who were there and see some of their photographs and pictures. And yes, we can never, ever forget. Aristides de Sousa Mendes Virtual Museum ( http://mvasm.sapo.pt/ ). Thank you for sharing this inspiring story of Aristides de Sousa Mendes who embodies the very meaning of courage. He deserves to be remembered and honored for meeting the challenge to fight the persecution of many people at risk from the Nazis. And thank you too for stopping by our blog and for taking the time to share this fascinating biography of a truly extraordinary man. Well done indeed. Possibly your best post yet, albeit the saddest and most thought provoking. You’re absolutely right that this timely post must remind us to continue drawing attention to history in similar ways. When we collectively (or conveniently) forget, these horrible things can happen again, regardless of people’s beliefs to the contrary. The ‘fake news’ of 1933 set the world ablaze, and wiped out whole populations. And it can happen again. Thanks for the great info. Thanks By and Mariah for your very kind words. That’s interesting that you would bring up the “fake news” as we can see what an effective tool it was in the thirties to scapegoat the Jews of Europe for all of Germany’s political and economic woes and galvanize whole populations into passively or actively participate in their genocide. And we can also see how effective the alt-right news of today can be as well as the partisan skew in mainstream media when it talks about Muslims, Mexicans and Blacks as threats in the United States. Like many people, we are having a hard time watching what’s happening in the last few months … A lot of lessons need to be remembered. Thanks Tim! There’s that oft repeated saying, “Those who cannot remember the past are condemned to repeat it” and we’ve talked often in the last few months about the many parallels between Nazi Germany and the rise in authoritarian leaders around the world today. If more people learned about the Holocaust as you did as a teenager or visited places like Terezin and Dachau and thought about what intolerance can lead to – the world would be a much better place.